Buy Kitesurf Bars Online - Kitemana! How does a bar work? First of all, we recommend anyone to get some kitesurf lessons before you start kitesurfing on your own. Kitesurfing can be dangerous if you don't know what you are doing. So if you're still wondering how a bar works, we recommend you take a few more kite lessons, just to be sure. 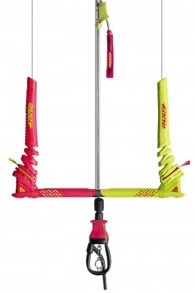 If you're just looking for more in-depth information about kite bars keep on reading. 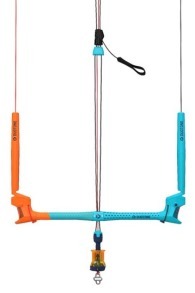 A kite bar is made to control your kite. When we talk about a bar, we often talk about the bar + all the lines together. 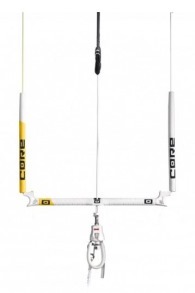 These bars can endure immense forces and they are made to transfer all the power from your kite to the rider. 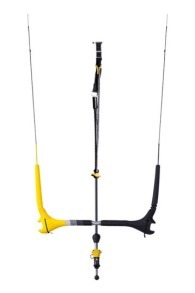 The bar used for kitesurfing consists of a control bar, steering lines, power lines, depower system, chickenloop, quick release, V split, safety line and depower line. Each brand has its own features, material use, and line lengths, but generally speaking, they all operate the same. The two steering lines are located on the back of the kite. 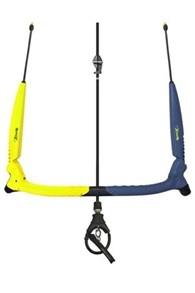 These steering lines are directly connected to the bar which the kiter holds in his hands. By making the left or right line shorter than the other, the kite will fly to that direction. 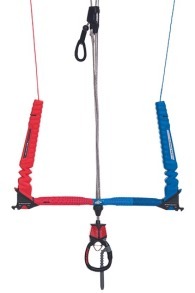 So if pull the left side of the bar, the kite makes a move to the left. When you pull on the right side, the kite moves to the right. Easy, right? Although make sure that you move a kite back in time, if you continue to move it one way, the kite will make a very powerful move, a kiteloop! 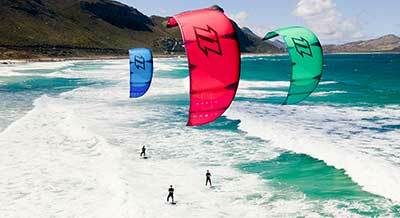 The forces of a kite are transferred through the front lines (powerlines) to the kitesurfer. 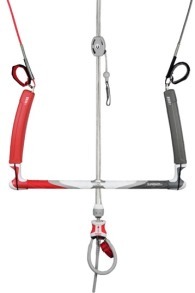 These power lines go through the bar center of the bar towards the harness. Another important feature of a bar is the ability to power/depower a kite. 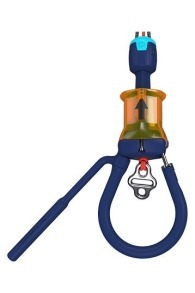 This gives your kite more or less power. When you pull the bar towards you, there will be more power on both steering lines. What happens is that your kite is tilted a bit so it catches more wind. We call this power. So if you pull the bar, it gives the kite more power which increases its mobility. If got enough power or need a little less you push the bar away. By doing this your steering lines get more room and the wind goes out of your kite, which will result in less power, we call this depower. So if you make a steering error, or you accidentally fall/crash the best thing is to let go of the bar, 99% of the time you will be safe. 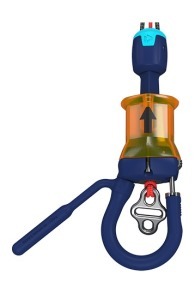 Almost all bars have a depower system, this is a system to give your kite an overall increase or decrease in power while kitesurfing. 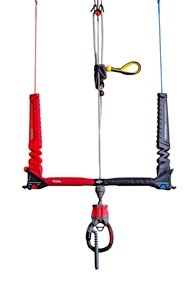 This system works through a clamcleat on the power lines. By making this longer or shorter the power in your kite will increase or decrease. For example, if the wind gets stronger all of a sudden, you can depower the kite by pulling the wire through your depower system. Do I need a separate bar for each kite? Normally you don't need a separate bar for each kite. For example, if you have 3 kites you could do well with two bars. 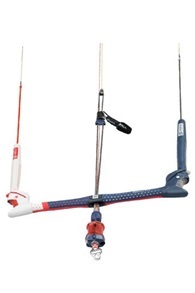 Although make sure your bar has the right size for the kite your using. Another thing to keep in mind is the fact that a bar doesn't always fit on each kite. 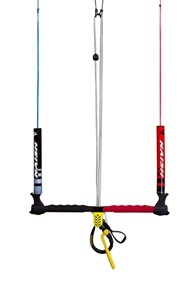 So if you have multiple kites of the same brand/type you probably use the same bar. You will save some money by doing this although its durability will drop a lot faster than normal. What bar size do I need? 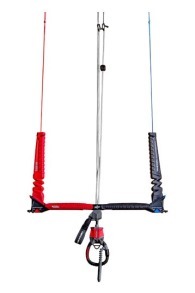 Kite bars come in many different types and sizes. It's important that you choose the right bar width for your kite. If you have a big kite you're going to need a large bar, if you have a small kite you will be better off using a smaller bar. This is because a larger bar has a bigger turn ratio than a smaller bar. So if you fly a small kite on a big bar, the kite will steer way too fast, which only makes it harder to control. You would be better off with a smaller bar. An average bar width is 52cm. 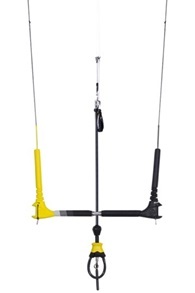 If you have a small kite, around the 7m, your better use a 44cm bar. If you have a 12m kite or even larger than we recommend a bar bigger than 52cm. You can adjust the width of most bars, so you can make your bar bigger or smaller if you switch kites. What is the effect of different line lengths on your kite's flying behavior? The length of the lines also determines the kite's flying behavior. A longer line increases the wind window of the kite. This also provides a better low-end. If you shorten the lines, the kite becomes more direct and aggressive. 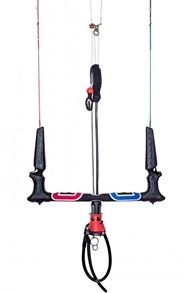 This is great for the freestyle kiters who love kiteloops etc. For example, the standard line length is approximately 24 meters. Kiters like Ruben Lenten often have 20m lines on their bar for an extreme agile character. For most freeriders, 24m is just fine. 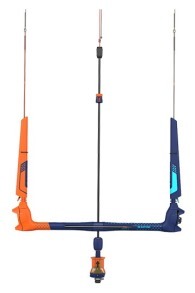 My line broke, can this be repaired or do I buy a new one? Sooner or later most kitesurfers will break a line. If this happens, no worries, we can easily replace them. When this happens it's often a sign that the durability of your bar has dropped This means in some cases that you have to replace the entire bar. In case the entire bar is still in good condition, you can just replace the broken line. We usually replace the lines in pairs. For example, if you break one power line, we put two new power lines on the bar. We do this because lines almost always stretch or shrink. To be 100% sure your kite is perfectly aligned, it's necessary to replace both lines at once. 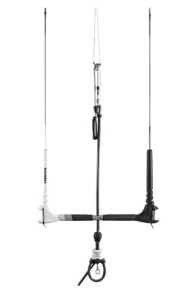 How do I attach my lines to the kite? The lines of the bar are attached to the kite's bridles by using pigtails. This happens with a very special knot, the so-called "cat's claw". At one side there is a knot, on the other side a loop. 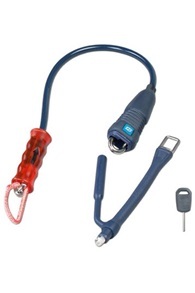 By pulling the loop through itself and put it over the knot, the loop stays firmly around the knot. When the kite is in the air and it generates power it will tighten the lines even better. 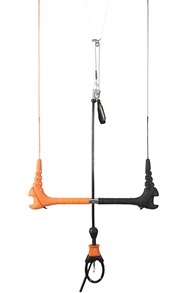 Pay attention during your kitesurfing lessons when the teacher explains how this works. If you somehow forget it or just not entirely sure if you have done it right, just give us a call or send us an email with a clear shot of your lines and we will help you to do it right. I have a knot on my line, what now? At first sight, a knot doesn't seem so bad, but this knot is a huge weakness in the line. It is therefore essential that you first remove the knot before hitting the water. How do you fix this? By chewing! If you gently chew on your line it will slowly gaining some space in the knot and will loosen up eventually. If you don't want to chew on your lines or just prefer that professional look at your lines, you can always bring or send the bar to us and so we can take a look at it and fix it one way or another. Kite lines, where are they made of? 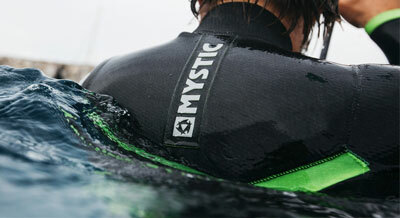 A kitesurf line is almost always made out of Dyneema. Dyneema is a very sturdy material with as main raw material polyethylene, one of the most commonly used plastic materials. The nice thing about Dyneema kite lines is the fact that they keep floating on the water and they are also water-resistant and even stronger than steel! Most kite lines can carry 300 to 500 kg. The power lines are normally a little thicker because they have the biggest tension between all the lines. After a few years, the strength and quality of a kite line can decrease. So always check your lines if they start to get weak spots (you can notice this by looking for a differentiation in color) and make sure you replace your lines/bar in time to prevent any accidents.